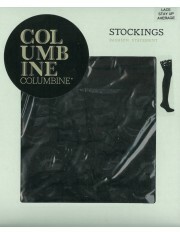 Our seductive Stay-Up Stockings collection is the perfect alternative to tights. Stay-ups or sometimes called Hold Ups are ideal for those who want to feel a little more dressed-up yet they are decidedly more versatile than stockings giving genuine comfort as well as enviable style and elegance. Stay-ups are designed to do just what they say – they stay firmly in place all day (or night!) and our collection is so comfortable you might even forget you’re wearing them. Choose from our selection of sheer lace-tops to glamorous seamed. You’ll be spoilt for choice with our extensive range!